Markers and crayons strewn across the table-- the dining room table. It has been over-taken by my children's activities a long time ago. Good thing the table is black or it would gladly bare all the colors of the rainbow! 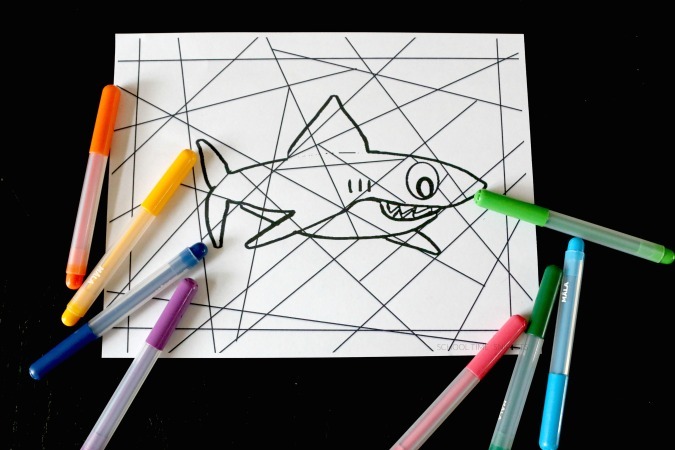 The latest activity at our dining room table-- a Shark Stained Glass Coloring Page. Coloring seems to be all the rage now. Funny how giving a classic activity a new spin makes it new and exciting! You cannot help go into any store now and not notice the coloring books marketed to kids and adults. Not gonna lie, but kinda rolled my eyes when the coloring fad came around. Why would I want to sit and color a coloring page for an adult; I have a hard time sitting with my child to color another page from her Strawberry Shortcake coloring book! However, to my surprise, I found coloring quite satisfying. If it weren't for the coloring activity at my MOPS meeting, I would have missed out on the fun of picking colors and designs and the feeling of accomplishment when all done. But my kids understand the excitement. 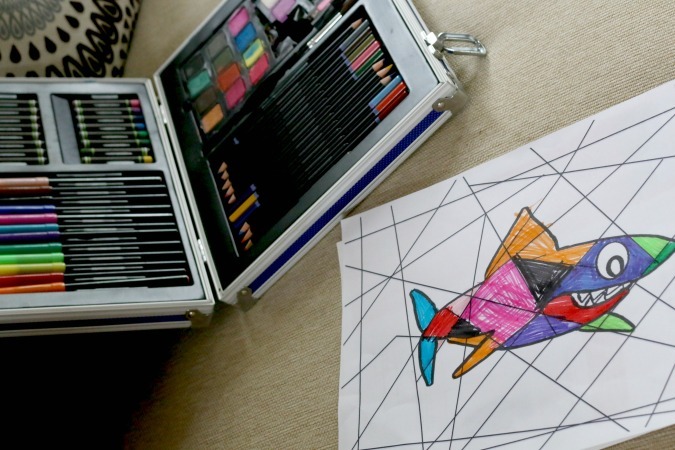 They LOVE to color-- especially my 5 year old daughter! 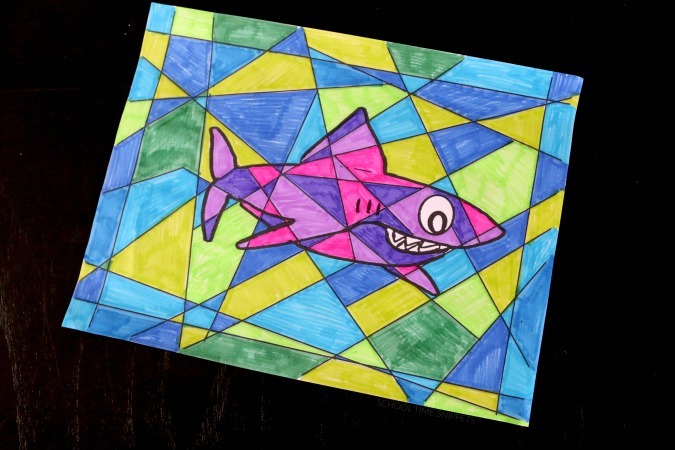 Inspired by Shark Week, I made a Stained Glass Shark Coloring Printable. And hey, I couldn't resist not coloring my own Stained Glass Shark, either! Another option to create a "stained glass" or mosaic look is to create ocean art is to use the black glue technique like Red Ted Art. 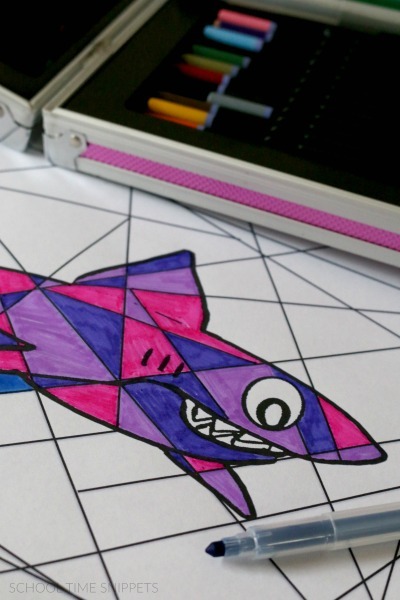 Unleash your creativity with this Stained Glass Shark Coloring Page. We used markers from my children's art sets and marker se t from IKEA. Just print off the coloring page and color away! Have fun choosing the colors to use and the feeling of accomplishment when all done! More Shark Inspired Fun and Learning! 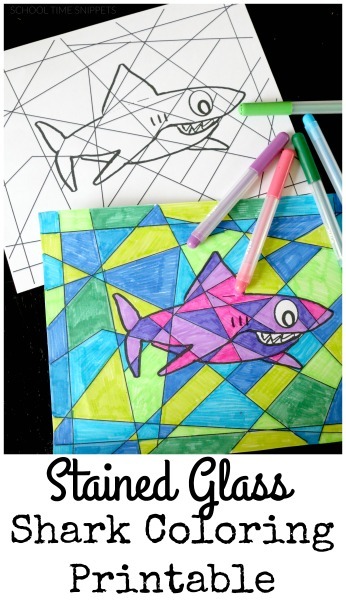 Download and Print your Shark Coloring Page Here!